Wednesday Morning at 1:04am my wife and I were awakened by a loud Wooosh by our window. I was sleeping actually and thought I had knocked a book off of the nightstand. I got up and started hearing distant sirens. I didn't think anything else about it until we were awakened again by the sound of helicopters and the first thought that came into our minds was " they're spraying for Gypsy Moths!". So there I am on the back porch looking up at helicopters flying in a tight circle and I realized it was something else. 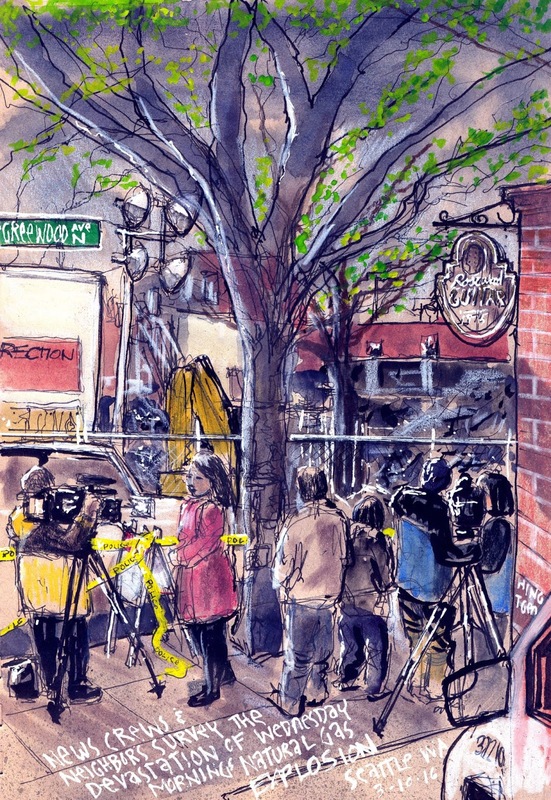 There was a Natural Gas explosion that flattened 3 businesses, sent 9 firefighters to the hospital and caused damage to 36 other shops in this lively and charming part of Seattle. I stopped by on Thursday night to see hundreds of neighbors, along with firefighters, police and news crews all surveying the damage and all being thankful for no deaths or serious injuries to people. Great reportage sketch, David. I love that neighborhood -- I hope those businesses are able to recover. I agree. Great reportage. Greenwood has been hit hard in the past few years.